The painting shows a view from the Pissarro's house at Éragny, looking towards the village of Bazincourt. The tall building on the left was converted into Pissarro's studio when he bought the property in 1892. 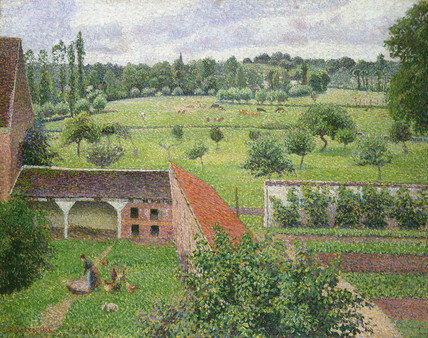 The composition, which the artist referred to as 'modern primitive', was begun in 1886 but not completed until two years later, in the painstaking Pointillist technique Pissarro used for only a few years.